Time to up your calligraphy/handlettering game! But how, you ask?? Seriously, this is so important if you want to do this right. Before you start any challenge, you need to have the right materials. It will go 1092748295743 times smoother! Here are some of my recommendations. This totally depends on what kind of pen/brush you decide to go with. Try them all out! That’s the beauty of a challenge.. you can really try all the different medias and papers and see what works best for you. When using brush pens, the paper isn’t a huge issue. However, it is when learning dip-pen calligraphy! If you are wanting some tips on Calligraphy Dip-Pen, click here. And if you want to learn more about brush pens and the whole how-to, click here. There are SO MANY options on what to use when lettering. So many. Some common options include brush pens, nib and ink, and watercolor brushes. So these are just my opinions are these are the pens that I have tried and love! Ok, now that you have the basics down, now it’s time to get creative! There is so much information out there these days that it is so easy to get inspired. Hop on Instagram or Pinterest and find some amazing artists! You can use keywords and hashtags to find what you’re looking for. Try words like “handlettering art” or “modern calligraphy ideas”. Hashtags you can use would be #calligraphyvideos or #handlettering. As soon as you search one hashtag or keyword (both on Instagram and Pinterest), more options will pop up under the search bar. That will help you immensely when it comes to finding content. You’ll find some amazing ideas on there. You can duplicate a design to get an idea of what you want to create, but put your own spin on it. Let your creative freak-flag fly! I’d love for you to check out and follow my Instagram for some fun videos, tips and courses! Hello! This is a given! A challenge (like this one!) will push you to create every day. You can post to social media or join with a friend to hold you accountable. Doing it with a friend is my fav because you can really motivate each other and feed off of each other. If you haven’t joined a challenge, I highly recommend it! Try out my brand new 30-Day Calligraphy Challenge and join others as we improve our skills.. and for free! 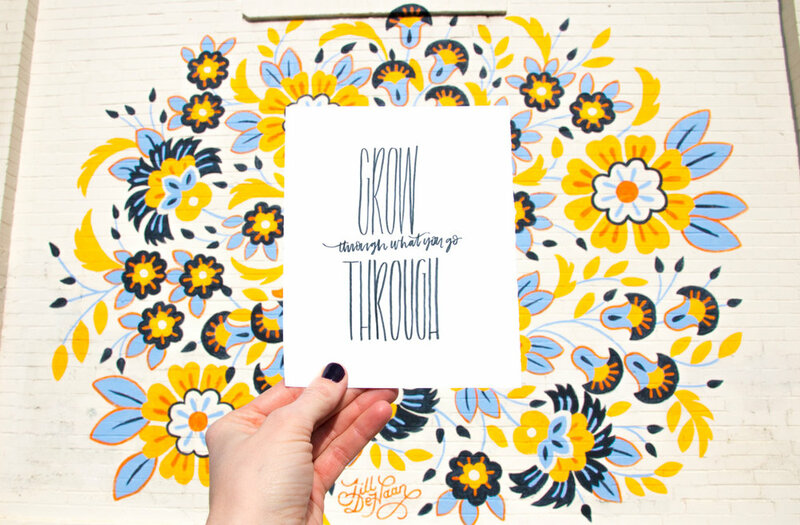 Join The Free 30-Day Calligraphy Challenge! 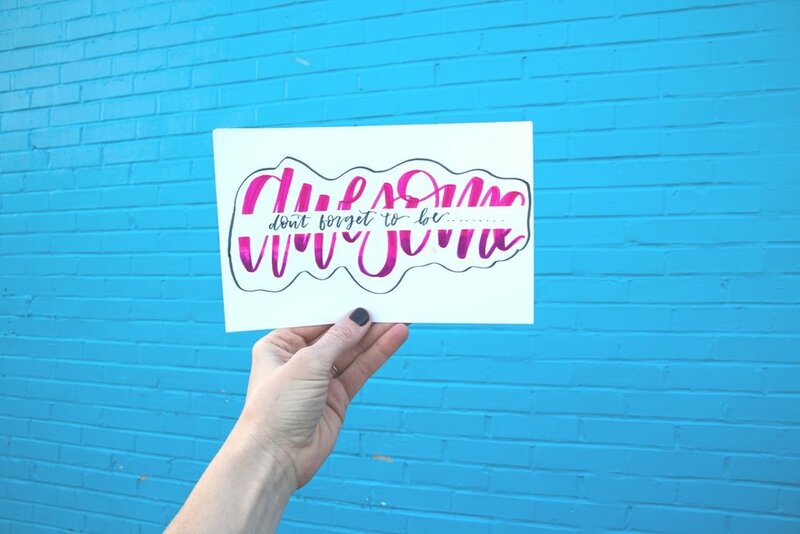 Improve your calligraphy and creativity skillllz with this month-long challenge! Designed to help motivate and inspire you to practice your talent. I respect you. No spam-y spam here. Thanks, friend! Now go your inbox and confirm subscription. Then.. you’re in! This is huge. Really dig into what your style is and how you want to achieve your signature font or look. Hone in what your vibe is. What styles have you seen that you really love? What are you strengths when it comes to lettering? Do you like simple or bold? Black and white or color? Ask yourself these questions and keep practicing. It will soon become clear to you and will be something that you love! THIS. This is how you make it happen. All those calligraphers that you follow on IG? They did not become that good overnight!! It took SO. MUCH. PRACTICE. And guess what? You can do it too! Joining a challenge is the BEST way to improve your skills. You can even create your own challenge with quotes or other ideas that you love. Try inspiring quotes, movie quotes or things your kids say. Make things that you would want to hang on your own wall and be proud to show it off. Even if you missed a day on the challenge, try to make up for it or just keep going. You’ve got this! I hope this helps and that you can commit to practice every day. If you have any questions or need advice, I’m always an open book! Feel free to email me, message me, or even tag me on Insta. Thanks, friend! Now go your inbox and confirm subscription. Then, you’re in! While you wait… let’s be friends!